Chunk style trailers have been around for a long time and what some of the best jig fisherman have accredited to their success on the water. For years pork trailers were used due to their durability and action however they also posed the problem of drying out if not kept wet or rolling up on the hook point and interfering with the hookset. Zoom has addressed these concerns and have provided a jig trailer which resembles the old style pork trailers in both look and action. 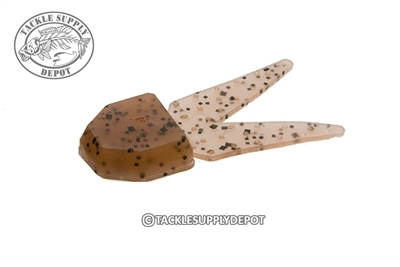 The Salty Chunk allows for an inexpensive substitute to pork and gives the jig a large profile that helps slow the fall down and waves seductively to on looking bass like a Crawfish in a defensive position. Chunk style trailers provide subtle movement that is excellent for cold water months where bass are lethargic and not reacting to fast moving baits.